The Honourable (retired) Chief Justice Lorne O. Clarke passed away on Saturday, May 21, 2016. He was 87. Chief Justice Clarke had retired in June of 1998 after 39 years in the legal profession - 22 years as a lawyer and 17 years on the Bench. He was appointed a judge of the Nova Scotia Supreme Court (Trial Division) in 1981, and four years later was named the province's 20th Chief Justice. He also served as Chief Justice of the Appeal Division of the Supreme Court (now the Nova Scotia Court of Appeal), administrator of the province and a trustee of the Public Archives of Nova Scotia. 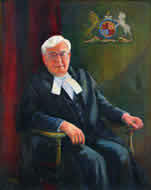 Chief Justice Lorne Clarke was born is Malagash, Cumberland County, N.S. A graduate in law of both Dalhousie and Harvard universities, the Chief Justice was always a strong proponent of continuing legal education and taught for several years as a member of Dalhousie's faculty of law. From 1959 until 1981, he practised law in Truro with the firm of Patterson, Smith, Matthews and Grant. His practice centred on labour and commercial law. He was well known as an arbitrator and mediator. He was a member of the National Academy of Arbitrators and the Society of Professionals in Dispute Resolution. Among numerous professional and volunteer commitments during this time, he served as chair of the Royal Commission on Workmen's Compensation in the Fishing Industry, a member of the Nova Scotia Law Reform Advisory Commission, a member of the board of governors of Dalhousie University and of Bar Council, and a board member with the Victorian Order of Nurses and the Canadian Mental Health Association, Nova Scotia Divison. Chief Justice Clarke was instrumental in launching the judiciary’s Legal Education Committee and also served as a member of the board of governors of the National Judicial Institute, the body responsible for providing judicial education to judges across Canada. After his appointment to the bench, Chief Justice Clarke held positions as secretary and vice-chair of the Canadian Judges Conference, he chaired a number of Canadian Judicial Council committees and was the council's second vice-chair from 1992-96. During his time as Chief Justice, he championed a collaborative and cooperative relationship among the various courts in Nova Scotia, and laid the foundations for the creation of the Executive Office of the Nova Scotia Judiciary, a body representing the entire Provincial Judiciary and the only one of its kind in Canada. Chief Justice Clarke was predeceased by his wife, Mary Lou. He is survived by his children Nora, George and Colin, and his grandchildren. Read the entire obituary here >>. Visitation will take place at Snow's Funeral Home at 339 Lacewood Dr. on Wednesday, May 25, from 2-4 p.m. and 7-9 p.m.
with a reception to follow immediately at St. Matthew's United Church Hall, Barrington Street.